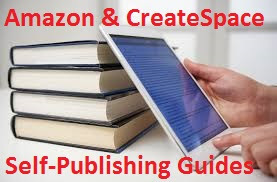 Self-Publishing on amazon and createspace platforms is quite easy but needs some directions especially if you have not published on these platforms before. Every publishing platform has its own challenges including amazon kindle especially in the design and formatting of ecover and manuscript. 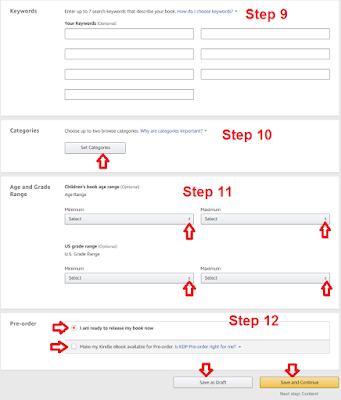 But a step by step guide simplifies the whole sign up, self-publishing process. I carefully wrote this article as a walk-through guide especially for novice authors and publishers who wish to self-publish their books, be it fiction novels, non fiction books or tutorial books through amazon with some book sales promotion and boosting strategies. 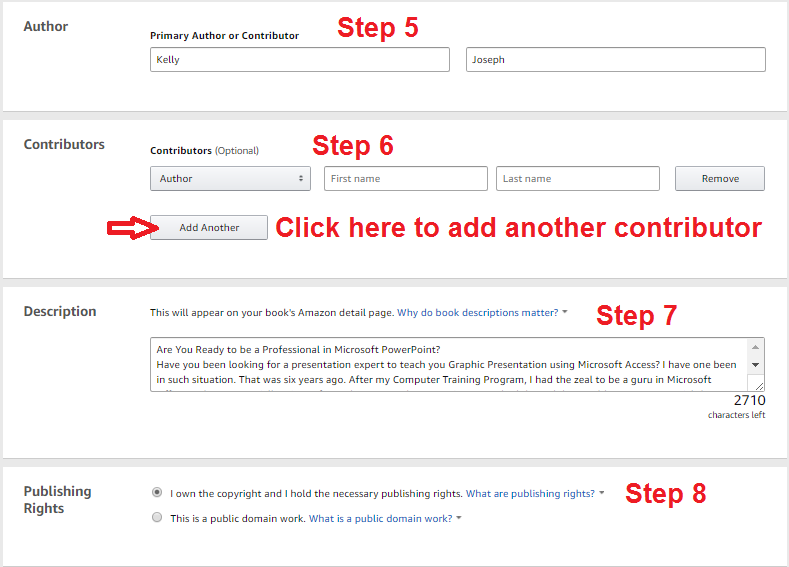 The procedure for publishing on amazon kdp and createspace platforms are almost the same. I explained HOW TO SET UP, SELF-PUBLISH & SELL YOUR BOOKS ON CREATESPACE in one of my tutorial articles. There are tons of reasons why you should choose amazon kdp and createspace book publishing platforms. The choice solely depends on your end target and objectives. But always bear in mind that the main aim of every Author and publisher is to make a lot of sales as quickly as possible. Amazon is now the most popular and largest online store especially when it comes to book publishing, distribution and sales. Amazon owns both Kindle and Createspace. Kindle is a series of eReaders and tablets offered by Amazon. They have varieties of devices for book reading which is one of the qualities that makes the platform unique. Along with the Kindle device, a Kindle app is available for every major web browser, smartphone platform and for both Windows and Mac-based computers. All you do is to publish your once through Amazon Kindle Direct Publishing (KDP) platform and it becomes available through the Kindle app and on any personal computing device. You can also publish a hard copy of your book with the platform called paperback format which is printed and distributed on customer's demand. Amazon specially created Createspace book publishing platform to concentrate on the printing, binding and distribution of book hard copies to customers and book retailers from book publishing pkatforms. This has helped Amazon kindle and createspace platforms to reach potentially billions of readers around the world. There are still more reasons why you should self publish on amazon kdp and createspace. I shared some of my reasons for choosing amazon kdp and createspace out of tons of available online book publishing platforms in one of my tutorial articles. Check it out! Before you set off to self-publish on amazon kdp, there are many things I personally advise you to put in place and decide. Advice: This tutorial article is a bit lengthy because I explained every step bit by bit to make sure you self- published your books easily. It will guide you through your book setup and publishing Process on Amazon. So prepare and relax your mind and then keep a cup of coffee or tea beside you! The first thing is your book manuscript. Make sure you have properly formatted and converted it to the format and file extensions that amazon recommends and accepts. See the latest list of supported ebook formats and full description of each format here. Don't include a cover in your manuscript compile, you will upload it separately to in .jpg format. You may wish to convert your book to formats like epub or mobi. You can use some software like: kindlegen. You can also download and use a software called Calibre to format and to convert your manuscript. Click here to watch the Demo. But if you are conversant with Microsoft Word Editing application (from version 2007 and later), you don't need these tools. You can use MS Word to edit, format, generate table of content and convert your manuscript from .docx format to .htm format by clicking to File tab > Save As > Select Web Page, Filtered in the Save As Type and then clicking on Save as shown below. 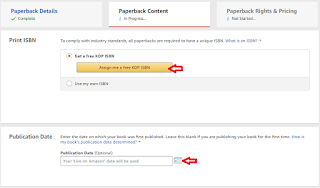 When you upload it on amazon kdp, it will be converted to the required format automatically. Note that you will need MS Word version 2007 and later to achieve this. In one of my tutorial articles, I explained How to format your kindle and Createspace books using Microsoft Word. Remember, book formatting and editing needs professionalism!. If you can not do it yourself, hire an expert. Another important thing is your book cover. Your book cover is the first to speak about your book when ever a potential buyer comes across your book. Always use professional book cover designs for your books. 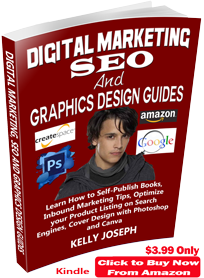 You can use software like Adobe Photoshop, Indesign, Illustrator, Spark and Canva, among others to design your book cover both for kindle and paperback formats. The accepted format for your kindle ecovers is ".jpeg" or ".jpg". For amazon paperback and CreateSpace print books, you need to convert the cover design to Print ready PDF format. The most recommended width to height ratio by amazon is 1.6:1 (2,560 x 1,600 pixels). But I use 2700px by 1800px for most of my books. If you want a wider width, you can try a wider ratio. I explained how to design professional book covers with Canva and Adobe PhotoShop in some of my tutorial articles. The required image resolution for kindle ecover is 72 pixels/inch or DPI and 300 pixels/inch or DPI for paperback formats. Also ensure that your cover image is less than 500MB to avoid compression. If you can't design a professional book cover, then find an ecover design experts. You can find some on fiverr. Check out some of my book cover designs. I designed them myself and I can always help you if you need my service. Just write me through my email. Make this decision before you continue the publishing process! Both Kindle Direct Publishing (KDP) and KDP Select your work with the millions of Kindle owners and readers who use Kindle apps on their smartphones and tablets. Both offer 70 percent royalties for books priced $2.99 to $9.99. I will advise you to enroll your book in the KDP select program for at least the first 90 days from the date of publication. The main difference is that KDP Select requires 100 percent exclusivity i.e. you cannot sell your ebook anywhere else even in your own website. Also, KDP Select offers a free promotion period which allows you to either offer the book free for five days or discount it for up to seven days through a Countdown Deal, which helps to boost your book ranking. Another advantage of including your book in KDP Select is that your book will be included in the Kindle Owner’s Lending Library [KOLL] and Kindle Unlimited [KU]. This means you get a share of the KDP Select Global Fund depending on the amount of pages read and your books borrowed by customers, thereby increasing your monthly royalty payments. The decision all depends on you! Another strategy is to opt in for KDP Select at the early days of your book, then once your platform grows bigger, you can choose to opt out and sell on other book publishing platforms. Take time to do a keyword research for your book. This will enable you find the best fitting title, keywords and categories for your book. Amazon allows only seven keywords to be used per book. Selecting the best keywords for your book is critical to being discovered both on Amazon and Google. Merchant Word: I recommend Merchant Word Keyword Research Tool for you. It shows you rank of each keyword by country and the categories they best fit in. It is not only used for amazon keyword research. Amz.one: A powerful keyword research and marketing tool for kindle books. It shows you how popular a keyword phrase is. I use it myself, it is awesome. You can use it for free for keyword research but if you want to use it to promote your book, then you will opt in for a premium version. Just sign up and click on the Keyword Research tab and then search some keyword phrases. KDP Rocket: A great tool for comparing Google search results to Amazon. It gives you a competitive score from 1-99, gives you a number of how many people type the keyword into both Google and Amazon, and how much money other books are making. KW Finder: It gives an analytical view of the keyword popularity using a competitive ranking. This is free for only five keyword searches a day. The strategy I use is to first make a list of possible keywords for my book and then, begin the strategies process of testing these keywords with these keyword research tools. Though this strategy takes a lot of time, but it yields desired results in terms of book sales and ranking. Amazon also allows you to choose a maximum of two categories for your books. The best and easiest way to find the matching and suitable category for your book is to search and checkup the categories of similar books on amazon. I wrote on HOW TO OPTIMIZE YOUR BOOKS RANK FOR AMAZON & GOOGLE SEARCH ENGINES in one of my tutorial articles. The question of How much to price your solely depends on you as an author. Amazon gives you that free hand! The only condition is that any ebook that you price between $2.99 and $9.99, you get 70% as tour royalty. If you price over or under this price range, you get 35%. I always utilize this highly yielding price range ($2.99 to $9.99). You just need to set the price in Dollar and then amazon converts it to the equivalence in other sales store countries currency. There are many things you should consider when setting a price for your book. The first is the quality and category of your book. Fiction books are always cheaper than non-fiction novels. You should also consider the price of similar books. I have also discovered that the optimum price range for most books is between 2.99 to 4.99, with the greater percentage closer to 2.99. You can always experiment yourself! But more popular books can still thrive well at a higher price. 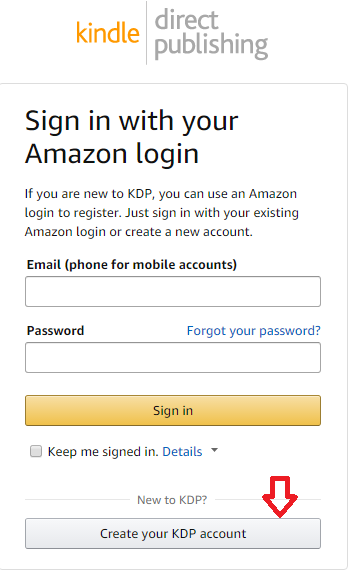 Having shown you some reasons why you should publish on amazon and some pre-publishing tips, let me now walk you through the entire process of signing up or creating an amazon kdp account, how to set up the account and then how to self publish your books on this awesome platform step by step. Open your browser and go to www.kdp.amazon.com. Click on Sign Up to register or Create a new account. 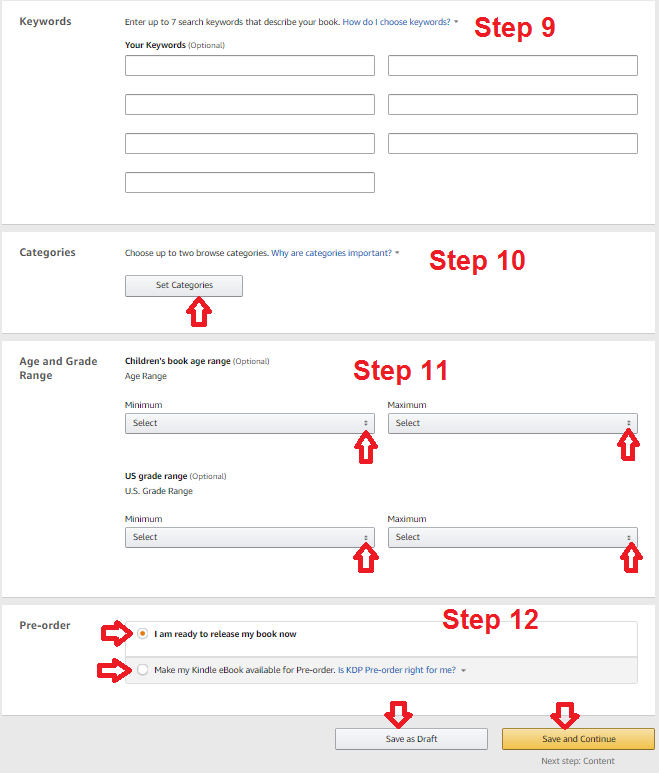 Note that you use your existing Amazon account or create a new one. You personal information will be required like name, address, country, active email address (will be used for account verification), etc. and you will be required to provide additional information, including your banking information, etc. And you will also fill a tax form as an individual or as a corporate body. After the sign up process, a verification email will be sent to the email you specified during the registration process. 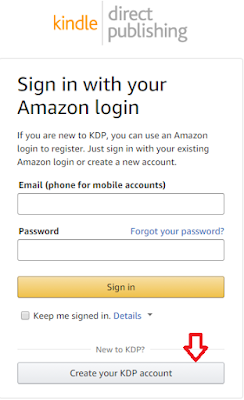 Log into the email account and follow the specified instruction to verify your amazon KDP account. After successfully creating an account and signing in, Amazon takes you to your Kindle Dashboard from where you can publish new books, edit and manage previously published books in kindle and paperback formats. You can also access book sales report through this dashboard. Click on Add New Title for Kindle book or for paperback depending on the one you are publishing as shown below under the Book Shelf navigation tab. You can start adding some of your book's information, save them as draft and then come back to complete the setup and publishing process. I always prefer to set up my kindle ebook before setting up the paperback version because it makes the whole process easier. 1. Content language: This is the language with which you wrote your book. Just select the desired language from the drop down menu. The default language is English. 2. Book title: This is a required information for every book. You should carry out an extensive keyword and market research using those tools I mentioned above to find the best phrase or group of words that is suitable. It should be engaging enough to catch a buyer's fancy. 2ii Subtitle (Optional): But it is very necessary especially for non fiction books because you can insert some of your main and minor keywords there to improve your book's SEO. The series name and volume number will help customers find other books in your series on Amazon. On Amazon, your series name will appear in parentheses beside your book title. If you want readers to see which number this book is in the series, you can enter the number into the series title so that the number shows up in parentheses. A series is a connected set of books. If your book is part of a series, identify where the book exists in the sequence with a volume number. Amazon and CreateSpace only accept volume numbers in numerical format ("1", "2", or "3"). The screenshot below illustrates steps 1 to 4. Insert the full name of the Primary Author or Contributor here. If there are other contributors to your book, you can include their names here. You have a maximum of 4000 characters to add here. Customers view your book description as they shop on Amazon. Often, it is a reader's first experience with the content of your book. A well-written description piques readers' interest and assures them that your book is of high quality. Choose the I own the copyright and I hold the necessary publishing rights option if your book is under copyright and you hold the necessary rights for the content being published. 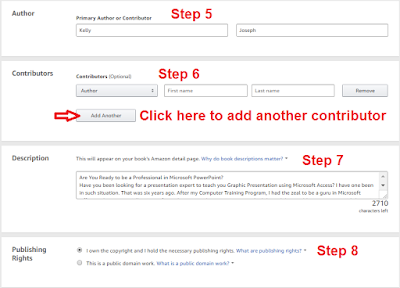 Select the This is a public domain work option if you are publishing a public domain book. Keep in mind that the duration of copyright varies between countries. So, if your book is in the public domain in one country but not another, you must identify your territory rights accordingly. The screenshot below illustrates steps 5 to 8. You are allowed to insert a maximum of seven keywords. Search keywords help readers find your book when they browse the Amazon site. You can enter keywords or short phrases that describe your book and are relevant to its content. The best keywords are those that do not repeat words in the title, category, or description, as these are already used to help readers find your book. Some types of keywords are prohibited and may result in content being removed from sale. Ensure you carry out extensive keyword research before you add them here. You can select up to two browse categories for your book. A browse category is the section of the Amazon site where users can find your book. Think of the browse category like the sections of a physical bookstore (fiction, history, and so on). Precise browse categorization helps readers find your book, so be sure to select the most appropriate categories for your book. If you are writing a book for a particular age range, you can specify them here. But it is rarely recommended. 12. Pre-order: This gives you the privilege to offer customers to pre-order your book as much as 90 days before the release date. On your book’s release date, customers who pre-ordered your book will automatically have it delivered to their Kindle. But it does not boost your book rank. If you wish to make your book available for pre-order, select the Make my Kindle eBook available for Pre-order option, else leave the default option. Note that if you cancel your book's pre-order option after it is set up, you will lose pre-order privileges for one year. Then click on Save and Continue to continue with part 2 of your book or click Save as Draft if you are not yet ready to continue with the book publishing process. The screenshot below illustrates steps 9 to 12. Step 11: Adult Content: Does this book contain language, situations, or images inappropriate for children under 18 years of age? Select Yes or No depending on the content of your book. Step 12: CreateSpace Books: Have you previously published this book on CreateSpace? Select No if you are publishing your book for the first time on any platform. Select Yes if your book was previously published on CreateSpace. You will then be asked to provide your book’s ISBN and Imprint name on the next page. You will also be asked to confirm your ownership of this title by logging in to your CreateSpace account. The screenshot below illustrates the two steps better. Congrats! You have just concluded part 1 of the book setup process on Amazon KDP. You can just have a cup of tea and then continue with part 2 below. In this part, you are required to upload your interior book manuscript, cover image, preview your book, for paperback format setup; print ISBN, Publication Date and Print Options (such as Interior and Paper type, Trim Size, Bleeding Settings, Paper Cover finish). The procedure is very similar both for an ebook and paperback with few differences. An ISBN (International Standard Book Number) is a unique 10-digit number assigned to every published book. An ISBN identifies a title’s binding, edition, and publisher. An EAN (European Article Number) is a 13-digit number assigned to every book to provide a unique identifier for international distributors. CreateSpace uses this type. The 10-digit ISBN is converted to a 13-digit EAN by adding a 978 prefix and changing the last digit. To publish a book, you can use either a free KDP ISBN or use your own valid ISBN (purchased directly from your ISBN agency). 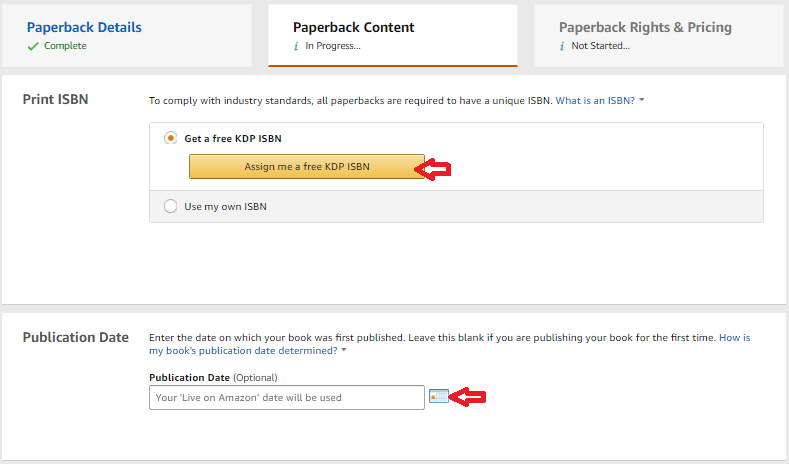 If you want to use amazon's free ISBN, select Get a free KDP ISBN and then click on Assign me a free KDP ISBN. If you have your own ISBN select Use my own ISBN. Kindle eBooks are not required to have an ISBN. The screenshot below illustrates steps 13 and 14 better. KDP books can be printed in color or black and white. Black and white books can be printed on either cream or white paper. You have three options available here: Black and White Interior with Cream Paper, Black and White Interior with White Paper, Colour Interior with White Paper. Select any any one you wish but remember that colour printing is generally more expensive than black & white. This refers to your book’s dimensions as it will be printed. You can use the standard default trim size (6" x 9") or you select a different trim size that matches your book manuscript dimension. 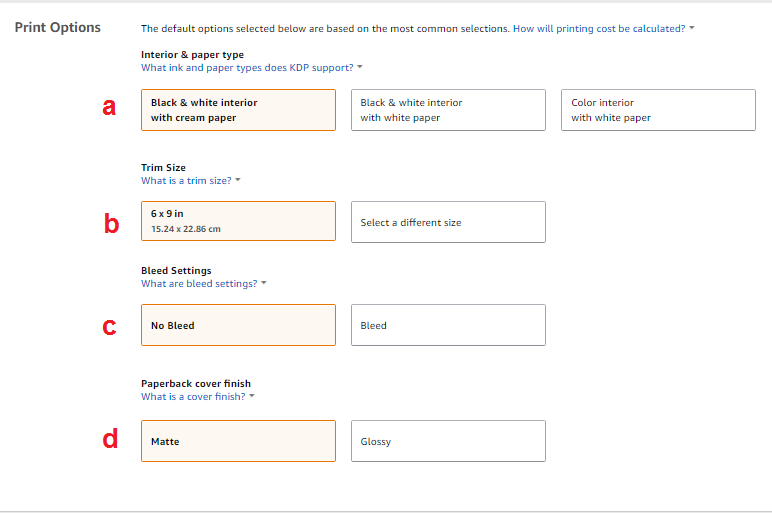 Setting your interior to Bleed allows printing at or off the edge of a page. It is used to support images and illustrations. Most books use No bleed unless there is a specific reason to apply Bleed. Changing the bleed settings will not change the manufacturing cost. KDP supports glossy as well as matte covers. Glossy has a shinny surface than Matte and the former is main chosen for textbooks and tutorial books like cookbooks, etc. The choice is all your! The screenshot below clearly illustrates step 15. For Paperback: Upload a manuscript of your book interior content. For best results, KDP recommends you to upload a formatted PDF for your paperback. You can also upload a DOC (.doc), DOCX (.docx), HTML (.html), or RTF (.rtf). If you have not yet formatted your manuscript interior, Choose and download a KDP template to make the formatting easier for you. You have to decide whether to enable DRM for your kindle ebook. DRM (Digital Rights Management) is intended to inhibit unauthorized distribution of the Kindle file of your book. Some authors want to encourage readers to share their work, and choose not to have DRM applied to their book. If you choose DRM, customers will still be able to lend the book to another user for a short period, and can also purchase the book as a gift for another user from the Kindle store. Important: Once you publish your book, you cannot change its DRM setting. I always choose No option for my books. Also know that choosing Yes does not make it totally possible for someone to plagiarize your ebook! Recommended interior formats for Kindle eBooks are: .doc, .docx, HTML, MOBI, ePub, RTF, Plain Text, and KPF. The easiest way to format your books is to use Microsoft Word (versions 2007 and later). This is the method I always use for my books. I wrote a tutorial article on how you can format your ebook and paperback manuscript with MS Word. Once you have ready-to-go manuscript for your kindle, click Upload ebook Manuscript. You can create a cover for your book using using amazon online Cover Creator tool or upload your own book cover you have previously created with with some graphic design software like Adobe Photoshop, InDesign Spark, Canva, etc. I explained how to design a professional ecover for your kindle and paperback books with PhotoShop and InDesign in one of my tutorial articles. For amazon paperback versions, if you want to upload a previously designed cover, the accepted file format is Print ready PDF only. For kindle ebook version, the accepted file format is JPG (JPEG) or TIFF format only. 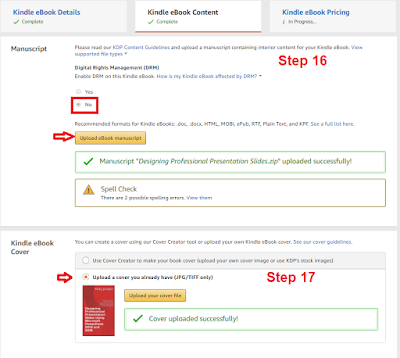 The screenshot below illustrates steps 16 and 17 for kindle ebook interior and cover. 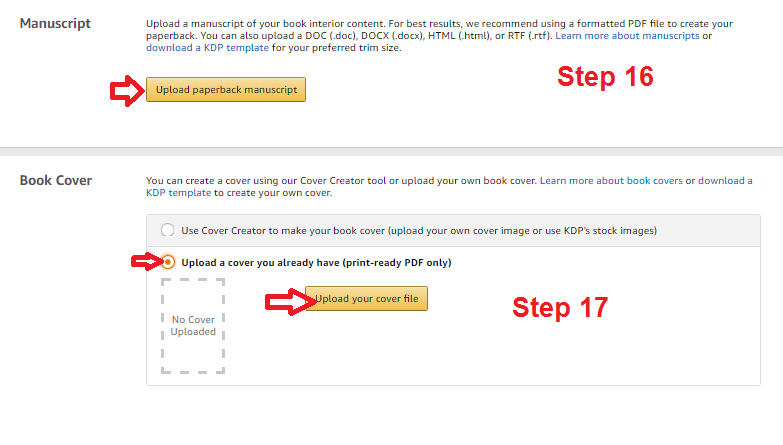 The screenshot below illustrates steps 16 and 17 for paperback ebook interior and cover. Preview your file to check for formatting and print quality issues. You must preview your book files and correct all errors detected before you will be allowed to go over to part 3. 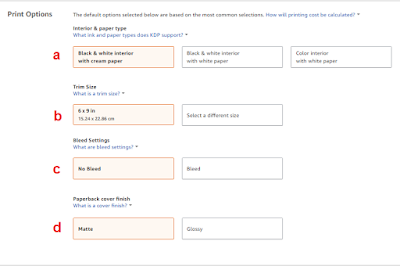 For kindle ebook setup, you have to preview options: Online Preview and Downloadable Preview - you either preview on your computer or on your kindle device. Kindle eBooks are not required to have an ISBN. But you can provide an ISBN code for your book but it will only be used to reference your book and it won't actually appear on the detail page of your eBook (only your book ASIN will). Have you proof read and corrected possible errors in your book file? Click Save as Draft or Save and Continue to move of to part 3 of your book setup. Congrats! You can now have some junk foods (I know you will be hungry by now!). Now let us go over to part 3! In this part, you will be required to specify your book price, territory where your book should be made available. 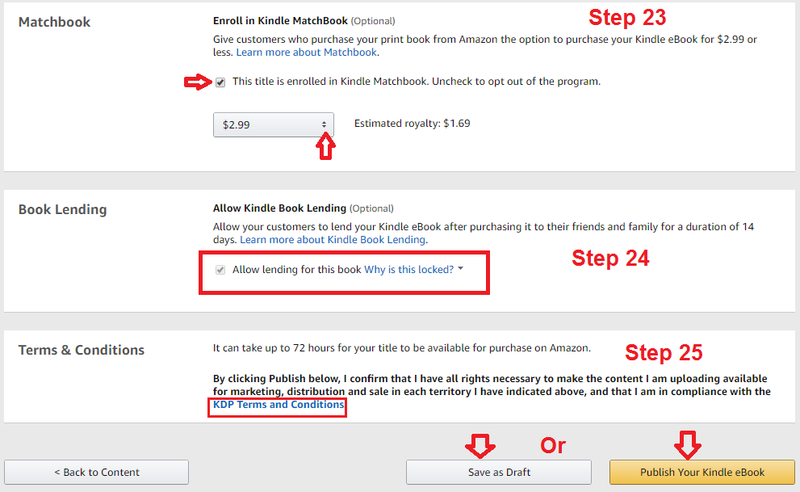 Then for Kindle ebook; KDP Select Enrollment, Matchbook, Book lending options, etc. With KDP Select, you can reach more readers, earn more money, and maximize your sales potential. Always your books in KDP select especially if you don't plan to publish them in any other platform. a. All Territories (worldwide right) - Select this option if you hold worldwide rights for your book. This enables Amazon to make your book available for sale on all Amazon websites and distribution channels. b. Individual Territories - Select this option if you don't hold worldwide rights to sell and distribute your title. Indicate the territories in which you hold rights. If you are publishing a public domain title, keep in mind that the duration of copyright varies between countries, so ensure you set your territory rights to only include those territories where you have determined the book is in the public domain. You are giving the privilege to tag your book with any price of your choice. For kindle ebooks, Amazon gives you 70% of that price as your royalty if your price tag fall within $2.99 and $9.99. The 70% option is available in the U.S., Canada, UK and most larger markets. Any other price range will earn you only 35% as your royalty especially in some smaller markets. 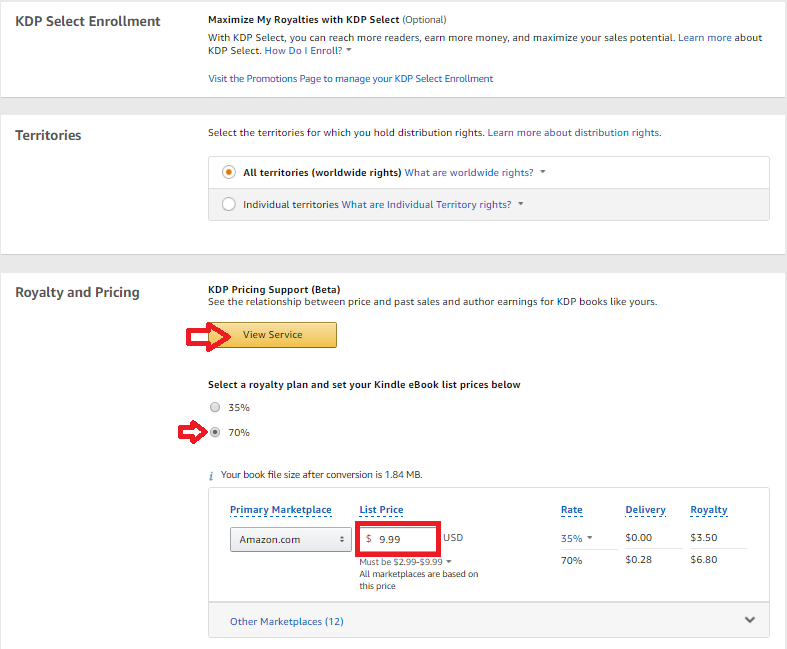 For the 70% royalty option, Amazon also deducts a small delivery fee for each book sold. This fee depends on the file size of your book file after conversion to kindle file format. In U.S., this fee is presently set at 15 cents per megabyte. But there is no delivery charge for the 35% royalty option. So the choice is all yours. The kindle ebooks have a larger market (about thirteen market places) while paperback market places are about seven. Just specify your price in dollar for the primary market place which is amazon.com and the equivalent of this price will be calculated and fixed for other market places. But always remember that there is a certain price range (optimum price range) you must use if you want to make a lot of sales. Each category of books has a different optimum price range. But for most kindle ebooks, it falls within $2.99 to $4.99. it is also a good idea to check up the prices of top ranking similar books to your before you conclude on your book price. 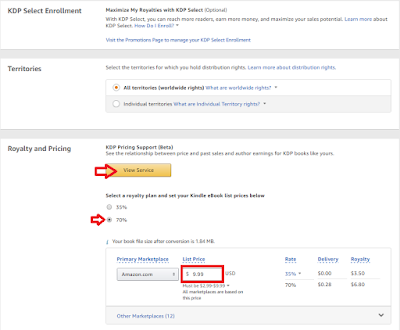 For Kindle ebook, Amazon provides an optional service or tool called KDP Pricing Support (Beta). 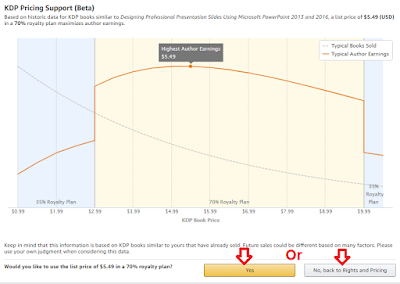 The services shows you the relationship between price and past sales and author earnings for KDP books like yours in a graph sheet. To utilize this tool, click on View Service under the Royalty and Pricing section. 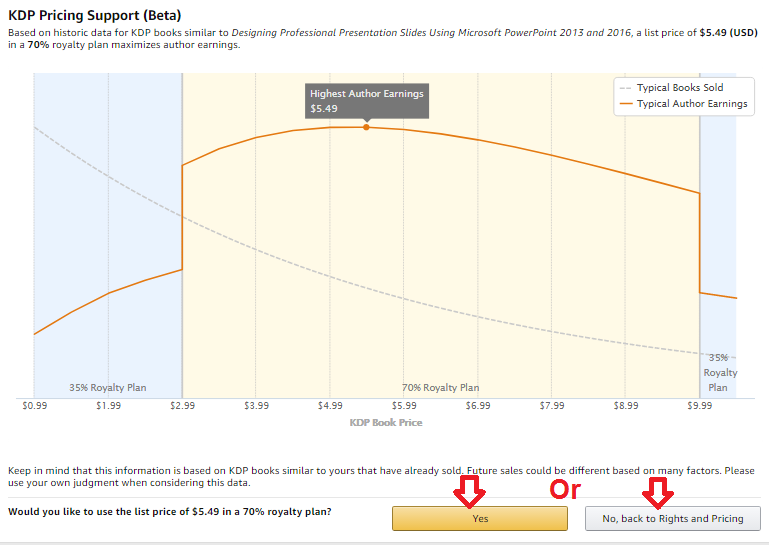 This opens a historical data graph and tells you the optimum price for the kindle version of your book as shown below. For your paperback: Amazon first deducts the printing cost of your book and then pays you 60% of whatever that is remaining. The printing cost of your book is directly proportional to the volume (number of pages) and then the book interior colour. Books with full colour attract very high printing cost than books printed black and white. The screenshot below illustrates steps 20 and 22. You may also wish to give customers who purchase your print book from Amazon the option to purchase your Kindle eBook for $2.99 or less. To opt in for this program, check the This title is enrolled in kindle matchbook box, else uncheck the box to opt out. You may also wish to allow your customers to lend your Kindle eBook after purchasing it to their friends and family for a duration of 14 days. To opt in for this program, check the Allow lending for this book box, else uncheck the box to opt out. Click the drop down menu to select a price tag for your kindle matchbook. Amazon calculates and displays your estimated royalty beside it. If you enroll your book for the 70% royalty then it must be enrolled in Kindle Book Lending. In such cases this option will be locked. It is only optional for books with 35% royalty. 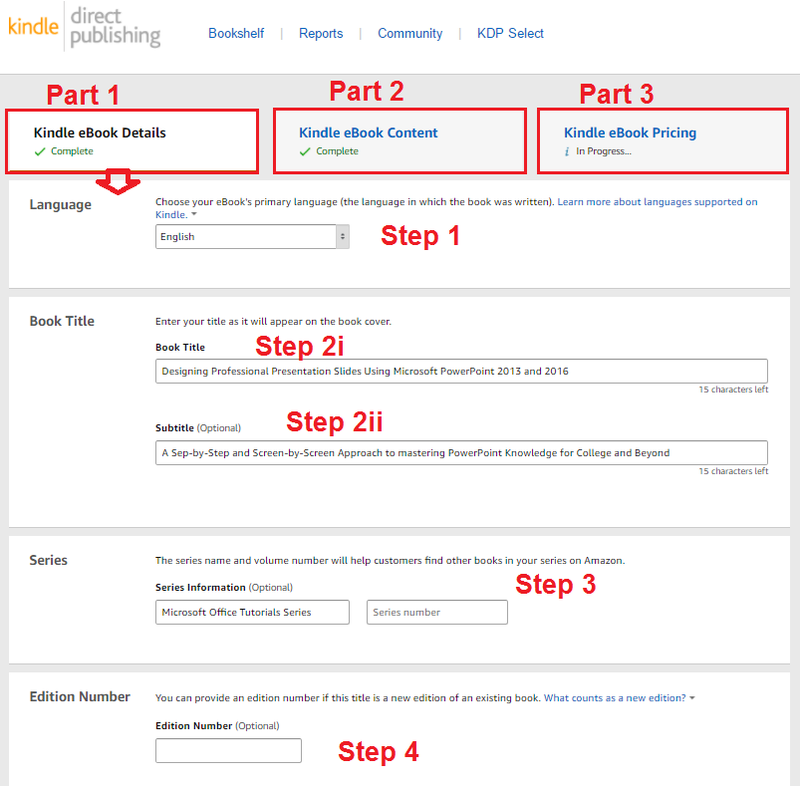 By clicking Publish Your Kindle Book or Publish Your Paperback Book box shown in the screenshot below, you confirm that you have all rights necessary to make the content you are uploading available for marketing, distribution and sale in each territory you have indicated above, and that you are in compliance with the KDP Terms and Conditions. 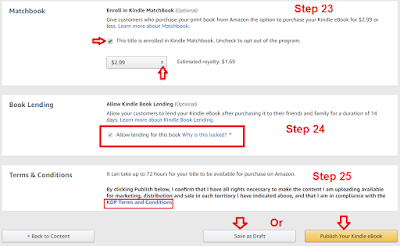 Read the KDP Print Beta Participation Agreement (for paperback books) and KDP Terms and Conditions (for kindle ebooks). 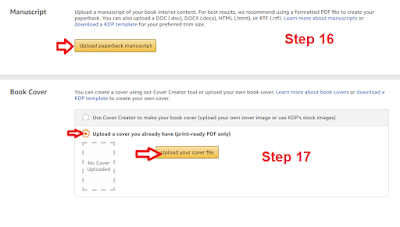 If you have setup everything as shown in this tutorial for your book and are ready to publish your book on amazon, click the Publish button, else click the Save as Draft button as shown below. The screenshot below illustrates steps 23 to 25. Congrats! You have just taken a bold step to your financial freedom! You are no longer just an author but a worldwide acclaimed author! I recommend you create an Amazon author page – a free service (through Author Central) that links your biography with your book listing. This helps to build trust. A buyer will prefer to buy a book that the author disclosed his identity to the one that the author did not disclose his identity. Promote your book and reward your loyal and early audience! To enjoy support from Amazon, you need to spread the word about your book yourself. While Amazon will help your book reach new readers, its algorithm requires the book to first hit a very high number of sales at its early stage. Setup coupon codes for your book and also utilize your free promotional periods. You have two options here: you get either five Free Days or one seven-day Countdown Deal. I advise you to utilize the five free days book promotion option as that yields more sales and helps your book to rank high very quickly. Don't forget the social media; facebook, twitter, linkedin, etc. 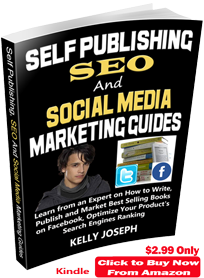 Share and tweet your book link in these powerful social media. They provide a very large market for your book! Also utilize free and paid book promotion sites like reddit, OzBargain, etc. Search the web to find out more of them. They also do great book marketing job! I wrote a tutorial article on the 10 TESTED STRATEGIES FOR PROMOTING AND MARKETING YOUR EBOOKS TO INCREASE SALES. Check it out! I know you have some suggestions or questions! I will be glad to hear from you in the comment box below. A very comprehensive how to. Thanks.